Looks to be a pretty standard setup. The interesting thing is there is a spot on the board for a 74LS32 to allow using 28 pin single enable CHR ROMs. 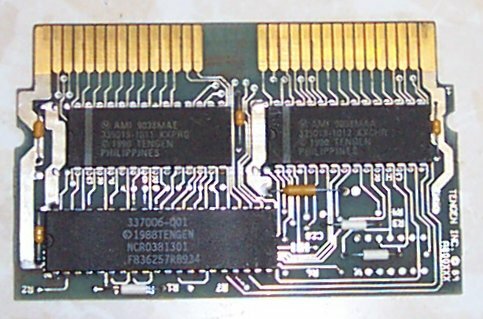 When the ROM is 64K or less, there are jumpers which can be placed on the PCB to bypass it. This was Tengen's "next gen" mapper hardware, and was only used on a couple games. up to 256K of each. I have tested these two pins. They are indeed extra address lines. R: CHR ROM bank size control. modes 8 & 9 control their respective CHR pages as indicated. 0 - registers in modes 0 & 1 are 2K in size. The registers at modes 8 & 9 ARE NOT USED. All other mode selections are unused. be generated unless C001h is written to again). counter decrements on each RISING edge. Any write here will trigger a reload of the IRQ counter (and select the desired clock source). value of 0ffh likewise generates an interrupt after 257d clocks. Disables and resets IRQ flag. Writing anything here will reset and disable the IRQ flag. Works identically to the MMC3. Enables the IRQ flag. Writing anything here will enable the IRQ flag. 3 8K banks are selectable.